Are you looking for a safe mattress for your kids? One that doesn’t break the bank, can grow with your children and is durable at the same time? We have done the research for you – read on to learn more. When choosing a new mattress for your child, there are a few things to look for that you might not be thinking of. Support: You’re going to want to look for a bed that is supportive to your child’s growing spine and provides a bit of firmness without sinkage, to keep their back properly aligned. Breathability: Some little kids sleep hot and so you want a bed that’s breathable and wicks away moisture. Safety: A bed without harmful toxins is paramount when choosing a bed for your children. Their small lungs will be breathing in whatever is in the bed, so make sure there is no toxic off gassing. A bed with some natural materials is best. Longevity: Choose a bed that can accommodate your child’s growth spurts and avoid a child sized mattress which can only fit a specific type of kids bed. A twin sized bed at minimum will last longer and work with your kid as they grow. A long warranty will also ensure you’re getting the best bang for your buck and it shows that the company has faith that their bed will stand not only the test of time, but your kids play and rest. Easy to clean: Whether it has a removable cover or is waterproof, several of the top beds on our list were chosen because they are easy to clean, as let’s face it, accidents happen. Take a look at our list of top 5 mattresses for kids that meet some or all of these criteria. Whether you are looking for a high-end bed made of latex, a memory foam mattress, or if you are on a budget, there is something here for everyone. So, keep reading and feel good about making an informed decision. You want a bed with some natural materials: While this DreamFoam mattress does contain layers of synthetic foam, it is a great price for a bed with some high end natural materials, such as latex and bamboo. Your child has allergies: This bed is a great pick for parents concerned about their child’s allergies or environmental sensitivities. Made with natural latex and CertiPUR-US foam, this mattress is hypoallergenic and contains no harmful materials. You want a supportive mattress: If you want a bed that will spring back and support your child’s spine, rather than have them sinking in, consider this bed, made with a substantial layer of Talalay latex, which provides an adaptive, contouring but supportive feel. If natural materials are of concern to you and you don’t want to break the bank, the Ultimate Dreams Eurotop Latex Mattress comes in at a nice price for a twin sized bed, with a lot of safe, luxury materials. With natural latex, a bamboo infused cover and all CertiPUR-US certified foams, this mattress is a great option for parents who are concerned about off gassing or toxic materials in their kid’s bed. It’s also Oeko-Tex certified, which means it undergone a high level of testing for harmful substances. DreamFoam mattresses are even made with a skin-friendly pH level and contain no heavy metals or formaldehyde. 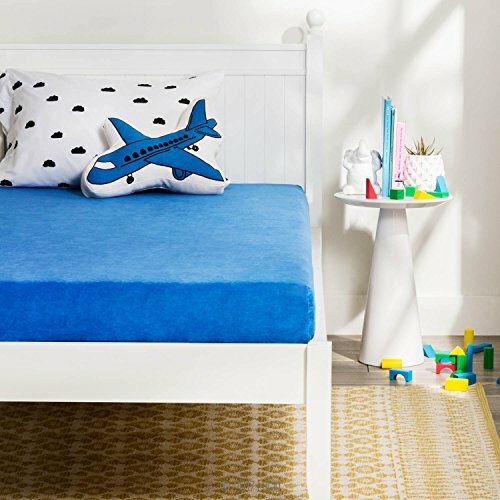 At its base is a high density, thick, 8-inch layer of poly foam, which makes it great for absorbing motion and perfect if you have that kid who is a light sleeper. Above this is a 3-inch layer of Talalay latex, which gives the mattress a nice level of bounce and cushioning, but will discourage those who like to jump on the bed. Instead, this mattress lacks the springy bounce of an innerspring mattress and the latex layer means there is no indentations where your child sleeps, like with memory foam. Latex provides a supportive and adaptive feel for your child’s growing spine and contours their body. It is firm enough to be resistant but not so firm that the bed feels hard under their light frame. Perfect for children with allergies or environmental sensitivities, Talalay latex is also hypoallergenic and best of all, DreamFoam mattresses have adjustable comfort layers inside the zippered cover, meaning that the firmness level of this bed can be adjusted, both to your child’s preference and their changing body. The base and comfort layers of the mattress are wrapped in a natural quilted bamboo cover that contains another 1.5 inches of soft reflex foam, providing the ultimate in luxury for your child. Bamboo is also breathable and naturally antibacterial and antimicrobial. With a great 10-year warranty and a 120-night sleep trial, you can be sure that this bed will last for years and that if it is not giving your kid a restful night’s sleep, night after night, it can be returned, no strings attached. 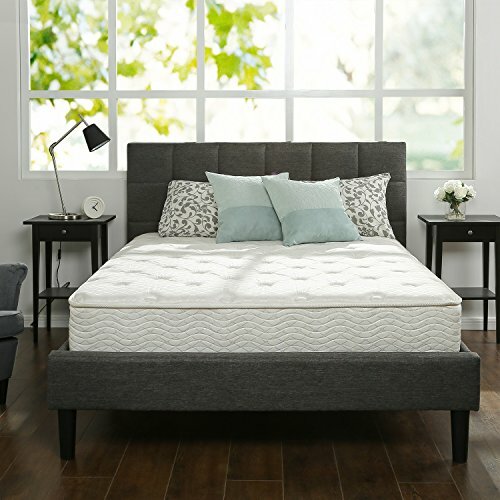 You are on a budget: For a reputable company, this mattress comes in at a decent price point, especially when considering the number of satisfied reviews. 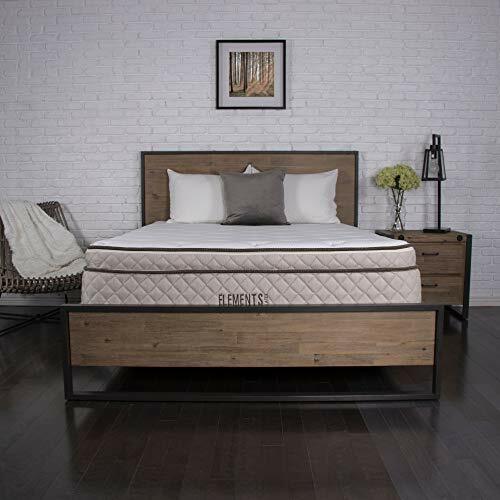 For a breathable, durable mattress with simple construction, the BKB is a great bed for those who don’t want to spend a lot on a bed that will last. You want a low-profile mattress: A low profile mattress comes in handy when you need it for bunkbeds or you have a small child who wants to climb in and out of bed by themselves. Big enough for your child to grow into, this is a lower bed compared to some of the competition. You want a mattress designed with kids in mind: The BKB mattress is made with a density level suited to children and is made to support their frames, comfortably, throughout the night. Not only that, but it’s fully non-toxic, safe and healthy for your little ones. If a latex mattress is a bit too expensive, Nest Bedding offers a great budget option in a mattress specifically designed for kids. The BKB, or the Big Kid’s Bed, is a decent option for those who want a bed in a box that will fit all bunk beds and twin frames, and is designed with a child’s weight in mind, although some lightweight adults might find it comfy, too. Apart from being our best budget option, the BKB mattress is also great in that it is low profile, making it easy for tots to climb in and out of, especially when it’s on that upper bunk. The BKB is made with pretty simple construction: It is comprised of a 5-inch layer of high density base foam and a 2-inch layer of Energex foam. Designed to feel similar to latex, Energex is made to be more cooling and responsive than conventional foam and is perfect for your child who always sleeps hot. Nest Bedding is also sensitive to providing non-toxic materials and the foams in this mattress are certified and the bed is coated in a non-chemical fire barrier. Customers report that this bed has no bad smell when it is decompressed and many people report that their children sleep on this bed, through the night, with ease. Rated between a 5 and a 6 on a 10-point scale of firmness, the BKB bed fits most children in terms of comfort level and provides a nice level of support and pressure relief. With a 100-night sleep trial and a ten-year warranty, this mattress is sure to give you bang for your buck and last throughout your kids’ childhood. You are looking for a bed with a cushioning feel: If you believe that memory foam might be the best thing for your child, then look no further as this is a highly-rated option with several sizes and thickness options. You don’t want to spend a lot on a memory foam mattress: Very few memory foam mattresses can compete with the price of this bed, which offers a decent 2.5-inch layer of memory foam for under $200 USD for a twin mattress. You want a memory foam mattress that isn’t too soft: Because this bed has a thick layer of high density base foam, it is rated as medium to medium firm, even though it has a 2.5-inch layer of memory foam. It provides the cushioning softness of memory foam, with the support and stability a growing spine needs. Memory foam isn’t just for adults, but not just any memory foam mattress will do. Kids need a certain level of firmness and support for their growing backs and a bed that is too soft, could cause them back problems. But the Zinus 10 Inch Green Tea Mattress is getting some good feedback from people who have purchased this bed for their kids as it has the cushioning comfort of memory foam, but is supportive enough to be great for kids. With a hefty 2.5-inch layer of memory foam, which makes up one of the four layers of high quality foam in this mattress, it is amazing that a twin-size mattress of this calibre comes in at under $200 USD for the twin size. In terms of safety for your children, all foams in the Zinus mattress line are CertiPUR-US certified and the foam is infused with natural green tea extract, which is meant to keep the bed fresh and naturally antibacterial. The bed is also built with a 5.5-inch base layer of Airflow high density foam, with a middle 2-inch layer of pressure relieving comfort foam. While Zinus makes a 12-inch mattress with a thicker layer of memory foam, this mattress ensures that the memory foam layer isn’t too thick for your growing child and the base layer provides the support that their spine needs, giving the bed a medium to a medium-firm feel. Reviews from many customers who bought this bed for their child suggest that it is supportive and comfortable, even for adults. Parents say this bed works great in bunk beds and although the cover isn’t meant to be washable, some people have mentioned washing it with no problem. Other customers mention that this bed is a great bed to switch to if your child is complaining about back pain from an old innerspring mattress. A few customers mention an off-gassing smell that dissipates a few days after decompressing the mattress and while there are no natural materials in this mattress, the CertiPUR-US certification is reassuring. While there doesn’t seem to be any advertised sleep trial period, the mattress comes with a decent 10-year warranty to cover any manufacturing defects that might come up. You want a cooling mattress: While some memory foam mattresses sleep hot, this bed is infused with gel and is thin enough that your child won’t sink in too much, making them too hot in the night. You want a waterproof removable cover: One of the best features of this mattress, this bed has a cover in pink or blue, that is easy to remove and wash and is fully waterproof. You want a low-profile twin sized mattress: At only 6 inches high, this is a great first bed for your child who is still learning to climb in and out of bed, or as a lower option for a top bunk. Another great option in the memory foam world, the Lucid 6” Youth Gel Memory Foam Mattress offers all the benefit of memory foam, with the bonus of gel infusion. One of the only memory foam mattresses designed specifically for children, this is a great option for that hot sleeper in your life and with a low, 6-inch profile, it makes a great option as a first “grown up” bed, or for that top bunk. But, this mattress is a great first bed for another reason – it’s fully waterproof, meaning any spills or accidents can be cleaned with ease. Yet, the soft, breathable cover won’t cause your kid to sweat through the night. The underside of the cover has a rubberized non-slip backing, so the mattress stays in place when your child is playing, making for a safe option. This bed is made with a 4.5-inch supportive base foam layer with a thinner, 1.5-inch layer of gel infused memory foam on top, meaning that it is soft and conforming to your child’s body, but is also supportive, with a good level of firmness. The foams are both CertiPUR-US certified and free of any harmful chemicals. In a choice of blue or pink velour, waterproof cover, your child can get excited at their new bed, made just for them. Customer reviews suggest this bed is responsive and goes back to its original shape, quickly and it’s good for children who are stomach sleepers, as they don’t sink in too much. The removable cover is a handy feature that parents are also loving and since it is soft velour, some parents just use it without a bottom sheet, removing it to wash it, as needed. This bed has a 5-year warranty, which, although isn’t as long as some of the other beds, is great for the bed’s low price. You are looking for an innerspring mattress for your kid: If your child doesn’t sleep well on foam mattresses or you are concerned about firmness level, or construction, you can always stick with a traditional innerspring mattress, that provides firmness and support. You want a lightweight mattress: For an innerspring mattress, this twin sized mattress is fairly light, at around 30 pounds. Best of all, if you want to ship it to your kid while they are away at college, it ships compressed and rolled, perfect for dorms. You want a bed that is affordable: You really can’t beat the price of this innerspring mattress for the amount of positive reviews. While it doesn’t seem to have much of a warranty, it’s a cheap and cheerful option for those who want a decent bed, on a budget. If you are wanting to avoid a foam mattress for your child and want something with more of a traditional feel, then consider an innerspring mattress. The Home Life Comfort Sleep 6 Inch Mattress offers the same great low profile of the memory foam mattress above, but with individually pocketed 15 gauge spring coils. Nothing like the pokey, uncomfortable spring mattresses from our childhood, this mattress has thousands of positive reviews from customers who rave about the quality of this bed, for the price. Many mention that the steel coils make their spine feel supported and that their weight is distributed evenly, across the mattress, without sagging. Parents are using this mattress in their kid’s bunk beds, without issue, and while a few are mentioning that it doesn’t make a great adult mattress, as it is so thin, it is getting no complaints from children or even as the occasional guest bed. 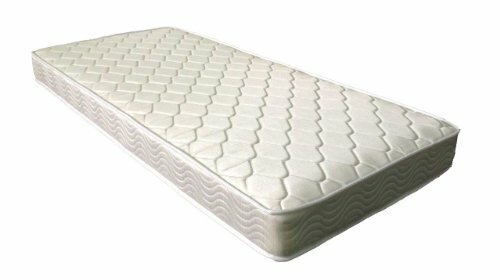 A few other parents mention that is a great bed to send to your kid’s dorm, as it is low priced and lightweight and comes compressed and rolled, unique for an innerspring bed. Because the mattress coils are individually wrapped, there is low motion transfer and no noise, so your child won’t wake themselves up when they are turning. Between the coils and the cover is a layer of foam and polyester, providing further motion absorbency and comfort. While there is limited warranty information available, the reviews suggest that this mattress will last through your kid’s childhood and for the price, even if it lasts five years, you’re getting a good deal. No matter what type of mattress you think is right for your child, there is an option here to suit all needs and budgets. Choose a bed appropriate to your child’s weight and size, keeping their individual requirements in mind. If they have allergies or environmental sensitivities, a mattress with some natural materials is best, even if it is more expensive. If you are just looking for a no frills, easy option, our budget innerspring or gel infused memory foam choices are perfect and with the waterproof cover on the latter, it is a perfect pick for those looking for a first big bed, for their growing child. PrevPreviousRem Sleep Behavior Disorder: Are you (literally) fighting dragons in your sleep? Staff Writer, Yogi, Recovering Insomniac. To offer you this article for free we receive a small affiliate commission if you chose to buy through our links. Click here to learn more. Nestmaven.com is a participant in the Amazon Services LLC Associates Program, an affiliate advertising program designed to provide a means for sites to earn advertising fees by advertising and linking to Amazon.com. Additionally, dev.nestmaven.com participates in various other affiliate programs, and we sometimes get a commission through purchases made through our links. We may receive products for free for review.